Many dentists in South Carolina offer cosmetic dental services, yet they are not qualified to call themselves a cosmetic dental practice. 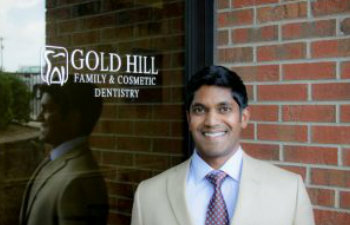 At Gold Hill Dentistry, we offer comprehensive dental care that serves patients of all ages. Dr. Kavi Sagunarthy and Dr. Jennifer Mokris lead our practice as highly skilled cosmetic dentists, and they provide state of the art dental care in a warm, relaxing environment. We understand that a person’s smile has a huge impact on their entire appearance, which is why we offer a full range of quality dental services including family dentistry, restorative dentistry, cosmetic dentistry, as well as emergency dental services. For many people, smiling with closed lips, turning their heads or holding up their hands to laugh, or even avoiding social situations all together are normal parts of their lives. They are embarrassed or self conscious about their smiles, so they avoid having to expose them. At Gold Hill Dentistry, our priority is the health and comfort of our patients while we transform their smiles into their best asset. We offer a variety of options to enhance or recreate a natural looking, beautiful smile. Through our thorough consultation process we work hard to find the perfect solution to your cosmetic concerns. We use the latest technology, combined with our years of experience and education, to help our patients achieve the smile they have always dreamed of. If you are in South Charlotte and are interested in improving the appearance of your smile, please contact the qualified cosmetic dental practice in Fort Mill today. We are the dental practice to trust for all of your dental needs, and our superior patient care makes everyone in your family feel at ease. Contact Gold Hill Dentistry today to schedule your appointment. We look forward to serving you.